Whatever its source, nitrogen (N) is essential for achieving optimum yields of grain, forage, and other corps. The same is true of phosphorus (P) and other nutrients. Applying too much nitrogen or phosphorus to cropland, however, can have adverse effects on the environment, particularly water quality. Excess nitrogen and phosphorus in surface waters can cause eutrophication (excess algae growth) and excess nitrogen in ground water can cause health problems in humans and livestock as a result of drinking water high in nitrate (a form of nitrogen). Farmers should aim to achieve optimum yields without applying excessive nutrients, thereby saving money and protecting the environment at the same time. Eutrophication is the slow, natural nutrient enrichment of streams, lakes, and estuaries that is responsible for the “aging” of ponds, lakes, and reservoirs. Excessive amounts of nitrogen and phosphorous speed up the eutrophication process. As algae grow and then die, their decomposition depletes oxygen, which kills fish, causes odor problems, and impedes the use of water resources for recreation and public uses. Eutrophication has been observed throughout North Carolina reservoirs, streams, and estuaries. Excessive nitrate in drinking water can cause human and animal health problems, particularly for infants less than six months. The United States Public Health Service has established a specific standard of 10 milligrams of nitrate nitrogen per liter as the maximum concentration safe for human consumption. Problems from excessive nitrate are rare in infants. The principal sources of nitrate and nitrates for adults are vegetables and cured meats, which supply more than 95 percent of the total nitrate in typical diets. Nitrate toxicity does occur in livestock, and the nitrate concentrations that produce toxicity are much higher than those for humans. Nitrate poisoning in livestock depends more on nitrate in feed than in water. 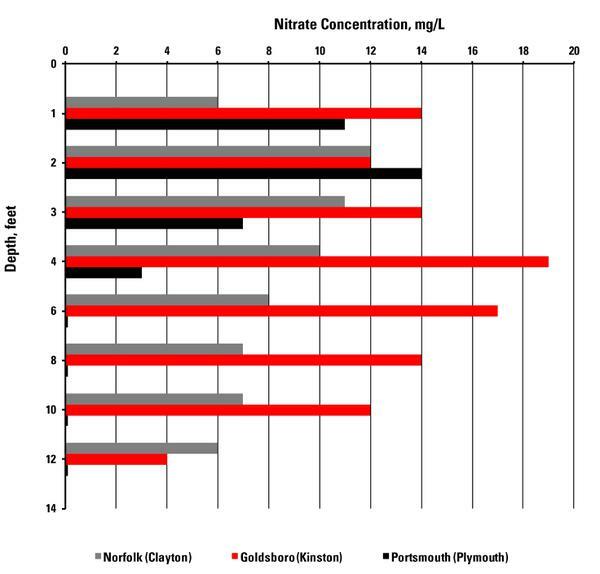 Nitrate-contaminated water is usually only a problem when it adds to high nitrate concentrations already present in some feeds. The long-term fate of land-applied nitrogen is the same whether it comes from field-applied fertilizer, legume residues, animal, industrial or municipal wastes, or other sources. The possible outcomes of this applied nitrogen are listed in the following sections. The total nitrogen in cultivated soils remains relatively constant over a period of years. Most of the nitrogen is present in organic matter, which varies among soils and among cropping systems on the same soil but is relatively constant for a particular soil on which a given crop rotation is used. Nitrogen mainly carries over from one crop to another within the organic matter, as increasing nitrogen content of a selected cultivated soil by increasing the organic matter takes decades and includes additions of nitrogen fertilizer, legumes, or animal waste. Regardless of whether nitrogen is in the organic or inorganic form when applied to crops on North Carolina soils, it undergoes transformation to yield nitrate as an end product. Some soil nitrogen may carry over as nitrate, which can be lost from the soil; thus, soil nitrogen as nitrate rarely accumulates. The amount of nitrogen harvested by crop plants is generally between 30 and 75% of the applied nitrogen, but research demonstrates that this will vary by crops, soils, season, and climate. Research in North Carolina has shown that approximately 75% of the nitrogen applied to sod crops (such as bluegrass or coastal Bermuda grass) is commonly recorded. Flue-cured tobacco also recovers 70 to 80% of the applied nitrogen in seasons of average rainfall. Typically, agronomic crops such as wheat and corn remove between 40 and 65% of the applied nitrogen in grain and straw or stover. Grain typically removes about 30 to 50% of the applied nitrogen. Because crops are not 100% efficient in using all the nitrogen (soil and fertilizer derived), even when fertilized well, excess nitrogen not used by the crop may be lost by leaching or runoff and represents potential pollution to water resources. Most plant-available nitrogen in cultivated systems is nitrate. Nitrate can also be lost through leaching through the soil and into the shallow groundwater. North Carolina State University soil scientists have documented that some fertilizer or soil nitrogen can be lost from the root zone to the atmosphere through a process called denitrification. This process is the breakdown of nitrate to forms of gaseous nitrogen, either nitrogen gas (N2) or nitrous oxide (N2O). 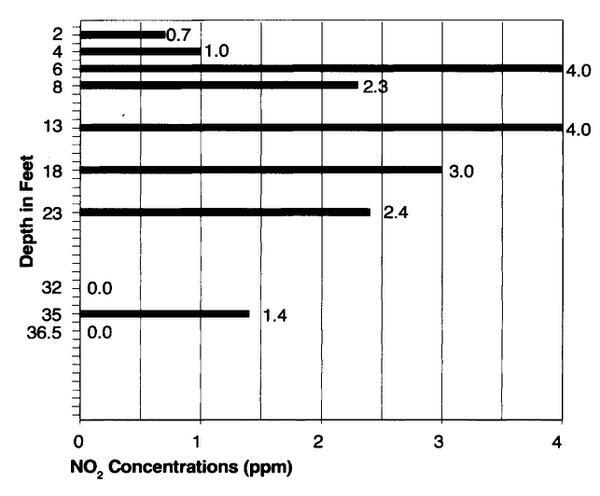 Studies have measured nitrate levels of 10 to 15 parts per million on moderately to well-drained coastal plain soils with low organic matter where little denitrification occurs (Figure 1). Loss of nitrogen as a gas by this process is not extensive in well-aerated, cultivated soils. Nitrogen applications to high-water-table soils of the lower coastal plain that are poorly drained and high in organic matter are the least likely to contribute to contamination of groundwater by nitrate. The organic matter in the shallow groundwater provides energy for microorganisms that promote denitrification and thus much of the nitrogen is lost in the gaseous form rather than as nitrate. Thus nitrate leaching losses are very low (approximately 1 part per million). The lack of nitrate below 13 feet is explained by the presence of an almost impermeable horizon (soil layer) between the 9- and 12-foot depths. These confining beds or layers are very common in the upper and middle coastal plain. Groundwater above these depths is referred to as shallow groundwater whereas the water below these depths is deep groundwater. Nitrate flows laterally along with shallow groundwater once the water hits the impermeable layer, thus contributing nitrate to surface waters. Many years of research at NC State have demonstrated that denitrification often removes between 25 and 50% of the nitrate from groundwater moving through buffered streams or wetlands. These same processes have been observed throughout the world. Piedmont soils are different due to the increase in clay and there is little nitrate leaching into shallow groundwater. 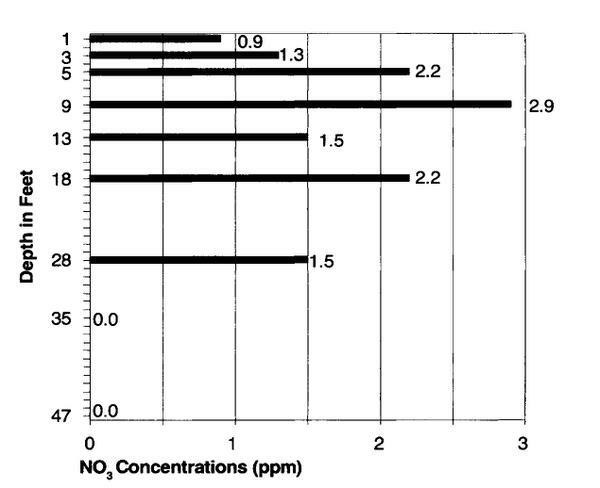 Figure 2 and Figure 3 show very low losses of nitrate, presumably due to denitrification. Figure 1. Nitrate-nitrogen concentrations in agricultural fields in North Carolina with depth. Figure 2. Groundwater nitrate concentration in an old cultivated Vance soil profile at the Oxford, NC Research Station. Figure 3. Groundwater nitrate concentration in an old cultivated Appling soil profile at the Upper Piedmont Research Station, Reidsville, NC. Nitrogen from fertilizers may enter streams through surface or subsurface drainage (leaching). Considerable loss of nitrogen may occur if heavy rains immediately follow a surface application of fertilizer on a moist soil surface, particularly in the piedmont and mountains with sloping soils. However, fertilizer nitrogen in surface runoff will be low if the fertilizer is mixed with the soil or there is little slope. The loss of organic nitrogen (contained in crop residues, animal waste, or soil material) could be considerable if intense rainfall results in substantial soil and debris movement. Because it has a high solubility, nitrate normally moves with rainfall. Thus, if fertilizer nitrogen is a source of pollution it is typically from leaching or subsurface drainage. Leaching has been studied within and slightly below the root zone and most studies indicate that between 5 and 25 pounds of nitrogen per acre are lost per year in North Carolina. Other studies monitoring surface losses suggest that approximately 2 to 10 pounds per acre are lost annually. Because nitrogen either does not accumulate in the soil, or accumulates very slowly because some percentage of applied fertilizer is not harvested with the crop, this excess nitrate is either incorporated into the soil biomass or is lost to the air or water. Because nitrate in groundwater and surface water is a potential health hazard and contributes to current eutrophication problems, fertilizer nitrogen must be applied carefully to crops. Managing nutrients is referred to as the 4Rs: Right rate, Right timing, Right source, and Right placement. Consistent use of the 4Rs will help prevent excess nitrogen loss from agricultural fields into surface and ground water supplies. Because a soil test is not a reliable means of predicting nitrogen rates, use the North Carolina Realistic Yield database to determine the appropriate nitrogen fertilizer rate for your crop and soil combination. Since leguminous crops, such as soybeans, peanuts, and alfalfa, make their own nitrogen, be sure to credit prior legume crops. A "strong" alfalfa stand may provide 80 to 100 pounds of nitrogen per acre for the next crop. Soybeans, however, will only provide 15 to 30 pounds of nitrogen. Once you determine the Realist Yield Nitrogen Rate, then simply subtract the amount of nitrogen provided by the legume to calculate the appropriate rate. For some crops, such as wheat, use crop tissue samples to help make N rate decisions. Right Source: If organic sources of nitrogen, such as animal waste, are being used, sample the material for nitrogen content and apply accordingly. Guard against "dumping," as this practice may contaminate water with excess nitrate nitrogen just before the crop enters a period of rapid growth. Rate Timing: Split-apply nitrogen; approximately one-third should be added at planting and the remainder later, depending on the crop. Proper timing ensures maximum daily nitrogen uptake and minimizes the likelihood of unused nitrogen leaching below the plant roots. If organic sources are used, apply them no earlier than 30 days before the crop is planted or 30 days after the crop is planted. Right Placement: The type of fertilizer or organic material, cropping system, and the tillage determines the placement (surface applied vs integrated into the soil).